When Cosmos showed the asteroid belt Sunday night, I noticed that, taking some artistic license to quickly get a point across, they showed it as crammed with asteroids. Anyone familiar with the real asteroid belt knows that’s not accurate. 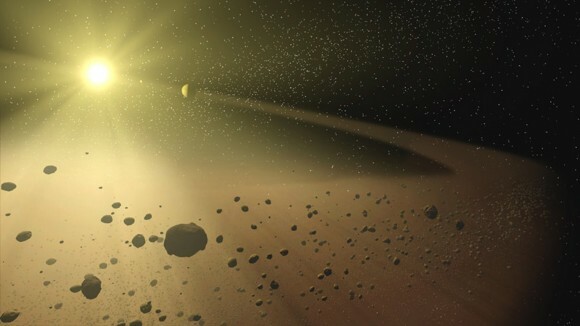 Even in the belt, asteroids are lonely rocks. When you think of the asteroid belt, you probably imagine a region of rock and dust, with asteroids as far as the eye can see. Such a visual has been popularized in movies, where spaceships must swerve left and right to avoid collisions. But a similar view is often portrayed in more scientific imagery, such as the artistic rendering above. Even the first episode of the new Cosmos series portrayed the belt as a dense collection of asteroids. But the reality is very different. In reality the asteroid belt is less cluttered than often portrayed. Just how much less might surprise you. more at Why the Asteroid Belt Doesn’t Threaten Spacecraft. This entry was posted in Zeitgeist and tagged Asteroid, Asteroid belt, asteroids, Astronomy, Hubble Space Telescope, Mars, Nasa, Science, Small Bodies, Solar System, Space, the asteroid belt. Bookmark the permalink. A neuroscience showdown on consciousness?